While graduation rates from high school are low, the numbers of those continuing their education at post-secondary institutions are even lower. The numbers below reflect the graduation rates for three different sections of the province in 2012-2013. To graduate with general status, means graduating with the most basic of courses. When one graduates with general status, the student would need to upgrade their schooling level through a bridging program before attending a post-seconday institution. 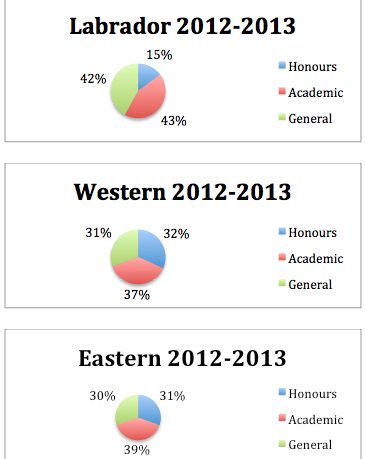 To graduate with honours means having above an 80% average in all core subjects and electives. Everyone else, if not graduating with honours or with general would graduate with academic status. The majority of those with academic status are eligible for admittance to post-secondary institutions. Post-Secondary education can range from the two university campuses in the province to college programs in multiple locations of across Newfoundland and Labrador. There are also various private colleges and trade schools in the province. In the past decade the importance of post-secondary education has grown. Throughout Newfoundland and Labrador there has been so much development in the area of energy and oil. Skill trades courses and programs are invaluable to these industries in the province. There are many more well paying jobs available than ever before. Fortunately, this area of education has shown the most promise and progress since the Land Claims Agreement in 2005. Between Nunatsiavut, the provincial government and the federal government, funding is being provided to develop many new programs.